Kimberly Stoll (Kimmy) began her academic training at Oklahoma State University where she received a degree in Psychology. Upon completing her undergraduate degree, Kimberly went on to complete a Masters degree in Biblical Counseling at Dallas Theological Seminary with a focus on play therapy and now a Licensed Professional Counselor. During her internship at DTS, Kimmy counseled children and parents at Children’s Health Medical Center Outpatient Psychiatry Clinic, Children’s Health Medical Center Day Treatment, Dallas Life Homeless Shelter, and provided play therapy at Ebenezer Grace Children’s Home in Hawassa, Ethiopia. 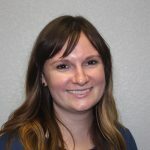 After her internship at Children’s Health Medical Center ended in 2015, Kimmy was offered a position at the Children’s Health Medical Center Inpatient Unit where she conducts milieu therapy with children who have become a harm to themselves or others due to many different mental illnesses. Kimmy works to facilitate a safe and accepting environment in which children can explore life through their natural language of play. Through collaboration with parents and play therapy sessions with children, Kimmy has seen hope restored and healing begin in the lives of children and families. In addition to her enthusiasm for play therapy, Kimmy is passionate about counseling adolescents. During her free time, Kimmy enjoys spending time with her dog Molly, photography, traveling, and cooking new foods.